Taking time this morning, making time, to find thyme in a garden. After an early morning stroll about, can you find the time? complete with woolly thyme tucked in amongst them. Alas, there is never enough thyme. What do you plan to do with your thyme today? Day Lilies in Full Bloom! The garden pops with color this time of year as the Day lily (Hemerocallis fulva) bursts open in all its glory. This hardy perennial will bloom late June thru early July. We have a lovely patch of day lilies near the pond. According to the book Flowers in the Kitchen by Susan Belsinger, all parts of the day lily are edible, although she suggests that the smaller buds (2 inches or less) are best for eating, while the petals can be used whole or finely shredded if desired. We like to pluck the buds and drop them into a jar of pickle juice, allow them to marinate for a week, and enjoy pickled day lily buds as a special treat. Of course, if you do this, you have greatly decreased the amount of beautiful blooming blossoms! What do you do with your day lily blossoms? We recently had an evening event in the tea room for the Cumberland Herb Society where we featured day lilies as the appetizer! Stuffed with savory cheese spread, garnished with fresh parsley, and several tasty crackers, they were served to oohs and aahs as the first course of an herbal tea party. Most of the guests nibbled their way thru blossoms, cheese spread and crackers. I did remove the stamens and pistol before stuffing with the cheese spread. They would also be pretty served on a luncheon plate, stuffed with tuna or chicken salad, perhaps hummus. Aren't they just cheery! If you were served this appetizer, would you eat the blossom? We would be remiss if we didn't acknowledge National Iced Tea Month! Summertime is finally here, the sun is shining in southcentral PA, and the iced tea is brewed, chilled and ready for kicking back, 'livin the good life!The brew on the left is a botanical blend, harvested from our garden, which includes lemon balm, lemon verbena, apple mint, and a touch of spearmint. After gathering a large bunch of these herbs, I tossed them into a gallon jug and covered them with about a quart of boiling water. Let the herbs steep for 20 minutes, remove them, and fill the gallon jug with ice cubes and water. I added two large lemon verbena stems to the gallon jar to continue to flavor the herbal brew overnight. This morning we have a very refreshing lemon tisane, naturally caffeine free, and unsweetened. If you would like, a touch of lavender syrup or honey would add another flavor component to the mix. Experiment! You can't go wrong. The tea on the right is a mint tea. Brewed using a black tea base with a large bunch of spearmint leaves added and sweetened generously with a cup of sugar to the gallon, it is a very refreshing way to celebrate National Iced Tea Month. Susanna, enjoying the bright summer morning while the kids are at vacation Bible school, opts for the caffeine kick the black tea provides. 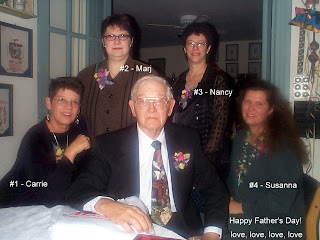 Note: This photo, taken in 2001, marks the celebration of our Father's 80th birthday. 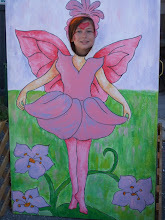 The Lavender Festival continues today and tomorrow, June 20th and 21st at Willow Pond Farm near Gettysburg, PA. If you get a chance to stop by, there are great programs featured all day long, the opportunity to pick your own lavender, purchase plants, and order lavender-flavored items off the menu. Tom Wajda, pictured here, and his wife Madeline, are the hosts for this fun event in rural PA. Their big beautiful farm house overlooks a field of lavender. Lavender, shown drying, takes center stage at this event. For additional details and program schedule, visit their website. Photos courtesy of Willow Pond Farm Herbs and Everlastings. Two of my sisters, Marj and Susanna, are vending at the PA Lavender Festival at Willow Pond Farms today thru Sunday. If you have the opportunity, I certainly recommend you take a quick visit! Located near Gettysburg, PA, this old farm has beautiful lavender fields, in full bloom. There's a great schedule of events for the weekend with lots to buy, and lavender to taste! If you happen to be in the area, be sure to tell Susanna I sent you! Recently we served fresh, local June Strawberries sliced and layered with Almond Cream and adorned with petite impatiens. We previously featured Strawberries and Almond Cream last year, garnished with violets, one of our early Spring edible flowers. For the Almond Cream recipe, and another presentation for serving this tasty and easy classic, visit this earlier post. Of course! A few of you commented on the horse picture (Ci Ci) in the last post... alas, she is not our horse and is happily stabled in a barn in the countryside. 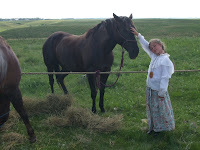 Angelica has been smitten with horses for a long time, even wondering out loud where we would keep a horse (her thought ~ 'parked' between the family vans) and where we might keep the hay. She even has 'clean up' duty designated. In the meantime, we continue to feed her love affair with horses from pony rides to horse riding lessons to wagon trains. Although Afternoon Tea is traditionally taken around 4 pm, we find that our guests enjoy the opportunity to take tea beginning at 11 am or slightly later... substituting lunch with our tea fare. Hence, our day might begin by preparing and serving Afternoon Tea in mid-morning and eventually transition to cleaning horses hooves in the early evening. We like to juggle variety in our day! How about you? Every Wednesday is SereniTEA at Sweet Remembrances (well, most Wednesdays! ), where we accept reservations for small groups (1, 2, 3, or more) for tea. In contrast with the Queen's Tea and other special events where we serve the Afternoon Tea in courses, we use the traditional three tiered serving tray, as shown here, for SereniTEA Wednesday. 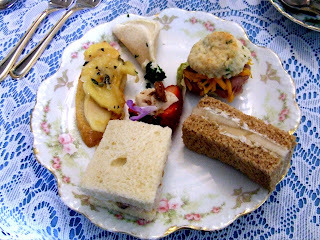 The tea sandwiches included egg salad fingers, cucumber rounds with French style cheese spread, strawberry sandwiches with mascarpone cheese, and chicken salad in pastry boats. 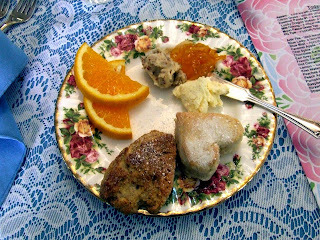 The oven fresh scones included traditional English cream scones and Orange Currant Scones with orange slices. The top tier held miniature lavender cheesecake, chocolate frosted chocolate cookies, and lemon curd tartlets. Edible flowers and rose geranium leaves garnished the food and plates. The menu for next Wednesday will be different than what we served this week. What's your definition of serenity? This tree like shrub is Indigo, a legume that the famous blue dye is from. It stands about 8 feet tall and is covered with these pretty pick flowers for most of May and June. Below is Baptisia australis, a dense hardy bush that also yields a blue dye. talk about putting a smile on your face! They are spectacular right now, and we are enjoying it! BTW... Susanna thanks you for all the wonderful birthday wishes last week.... and Nancy thanks you for all the great comments about the Queen's Tea. We enjoy and appreciate your thoughtful remarks as much as we admire the beautiful water iris ~ with heartfelt thanks! The Tea Room was transformed into a Royal Palace yesterday as we celebrated the Queen of England's Birthday. Her actual birth date is April 21, 1926 with the official celebration held on the 3rd Saturday of June. Our celebration, complete with champagne toast, is typically the 1st Sunday of June! Pots of steaming hot tea were served as guests were seated. The choices were many, the most popular is always Blue Lady, a strawberry, kiwi, and coconut blend, available at The Rosemary House naturally. The first course included French Style Cheese Spread piped in the shape of a large rose and served with assorted crackers. A heart shaped bowl bursting with Fresh Fruit and Sweet Cream was served next. The selection of five sandwiches included Swiss Apple Melt on Toasted Baguette Slices, Roast Beef & Honey Mustard on Mini Herb Biscuits, Blue Cheese, Walnut & Pear Sandwich, Chicken Waldorf Sandwich, May Flower Sandwich circled around a Mascarpone Topped Strawberry. The next course featured oven fresh scones - a heart shaped Kensington Palace Scone and a triangular Apple Cinnamon Scone accompanied with Imported Devon Cream, Pecan Honey Butter, Orange Marmalade, and Fresh Orange Slices. The final course, desserts, included a Rosewater Cookie with an Impatiens Blossom, Chocolate Chocolate Cheesecake, and Phyllo Cups with Almond Cream & Strawberries. Thank you to all those in attendance yesterday! It was our honor to treat you like a Queen for the Day! Often called Spiderwort plant or even Monkey Flower, this is a charming old-fashioned native American plant. It is a hardy perennial from Maine to Alabama and grows in a thick clump. It seems to die out a bit in the heat of the summer. Considering our close proximity to TMI, having a plant that is also nicknamed the geiger counter plant because the blue stamens turn pink when exposed to unsafe levels of radiation is probably a good thing! We are often asked what that large plant is growing over the arbor. The answer - KIWI. Yes, kiwi. There are several varieties that will tolerate our cold winters. As a strong vine Kiwi requires a sturdy fence, trellis or arbor to grow on. There are many varieties of Kiwi, some with variegated leaves and some fuzzy leaved like this one. You need at least one boy kiwi and up to 8 girl kiwis in order to yield fruit. The Kiwi crop in our backyard only grows to about the size of a grape, never quite ripe enough to enjoy, alas. The following is an excerpt from Mrs. Reppert's TwelveMonth Herbal. Originally Susanna Rebecca was named Susan Jeannette, meaning "Gift of God" - which she surely is. Then we renamed her for her great great grandmother Kauffman when she was given her heirloom "taufschein" or Pennsylvania Dutch birth certificate. Be that as it may, our Susie is a true Elgert woman who shares an inborn love of the earth and herbs with her mother and her mother's mother. Since she was a baby, Susie spent hours and days by my side, absorbing the realm of gardens and the depth of herbs. As a Girl Scout, she packed her suitcase for camp topped off with half a dozen large comfrey leaves. "In case I wound myself," she explained. Now a Master Gardener, she lectures on herbs, manages The Rosemary House full time and has initiated a popular apprentice gardener program, the idea conceived while she labored as volunteer (on her day off) in the National Herb Garden in D.C. Susie is young, eager, energetic and stuffed with creative ideas for our family enterprise. Seizing the reins firmly, she has created a diversified herbal product line which she takes to large gift shows, introducing us to a world beyond Mechanicsburg, The joy of herbs has wrapped this "gift" into a package that keeps on giving. Raised in the magic world of herbs, it is her birthright. These words, written by our Mother in 1996, stand true today. The years march on and the story continues of course. Creative and energetic, delicately balancing a career and young family, all the while sharing the joy and magic of herbs with family and friends. Happy Birthday Susanna Rebecca! You continue to make your Mother proud. Every afternoon, precisely at 4:30, when the days chores were done, preparation for Afternoon Tea began. Aparna enjoys traditional Chai daily, and it was no exception while staying with us. She cheerfully prepared enough Chai to spoil Susanna and myself. What a rare treat to have tea prepared for me! She would measure the water (2/3 c. per person) and pour that into a saucepan along with sugar (1 - 2 tsp. per person) and green Cardamon pods (1 - 2 pods per person) that had been lightly crushed in a mortar and pestle. For variety, she would also toss in a large pinch of dried lemon grass. This mixture was brought to a boil; at which point she would add the Assam tea, (1 tsp. per cup). Allow this to steep for about 3 minutes or so. As that was steeping, she would warm the whole milk (2 Tbsp. per person) in the microwave. The warm milk would be added to the water/spice/tea mixture and returned to a boil. Simply strain the Chai, pour into individual mugs, relax and enjoy. This was a lovely afternoon ritual, a simple way to stop and reflect upon the day. Aparna notes that the Cardamon and Lemon grass are enjoyed in Chai during the summer months, as they are 'cooling' spices/herbs. Cinnamon, Cloves, Ginger and Pepper, along with Cardamon are typically added to Chai in the winter months, as they are 'warming' spices. Although Aparna has returned home now, Susanna and I, on several occasions, have enjoyed Chai, precisely at 4:30. I must admit however, it simply doesn't taste as authentic as when Aparna prepared it. WWOOF stands for Worldwide Workers on Organic Farms. While we aren't a farm we are organic and do appreciate willing workers so this is a program we participate in! Basically, the workers come and live with you for a bit - we host for 4 to 10 days - and while they are here they work in the gardens or in the shop. All the while they are learning about herbs and eating well. This merry month of May we had three different workers. First was Amber, she was from San Diego and was spending the summer on the East Coast working on farms, community gardens and in church camp. Among other jobs, Amber worked hard on our Peace Garden - weeding, thinning out, adding new rocks. She also used her creative skills on making little hens and chick shoes for sale. Thank you Amber! Next was Aparna, from Portland Oregon, Aparna came to The Rosemary House to study medicinal herbs. We made tinctures, salves, and infused oils between weeding, watering and sweeping. Aparna weeded, thinned and planted our silver garden. This bed is planted with silver foliage plants in galvanized buckets and cans. She also spoiled us by preparing our afternoon chai break! Thank you Aparna! Last but certainly not least was Ibti. Ibti managed to leave before I snapped her photo in the garden. Ibti is traveling around the USA by bicycle and along the way stopping at community gardens, urban farms and more to learn about sustainable living. Check out her blog A Bikeable Feast about her wwoofing adventures and her incredible journey across the United States. Ibti was happy in the kitchen and I noticed Nancy was happy to step aside and let her cook away. So when she wasn't weeding and planting the basil garden, or making lavender soap, Ibti was preparing spinach pesto and Thai stir fry. Thank you Ibti! One of the end of the year projects at our elementary school is "vocabulary day" where the students dress as a vocabulary word of their choice. There were students dressed as "covert", "plume", "blue" and many many more. Our 3rd-grader went as "Botanist"~ a person who studies plants.